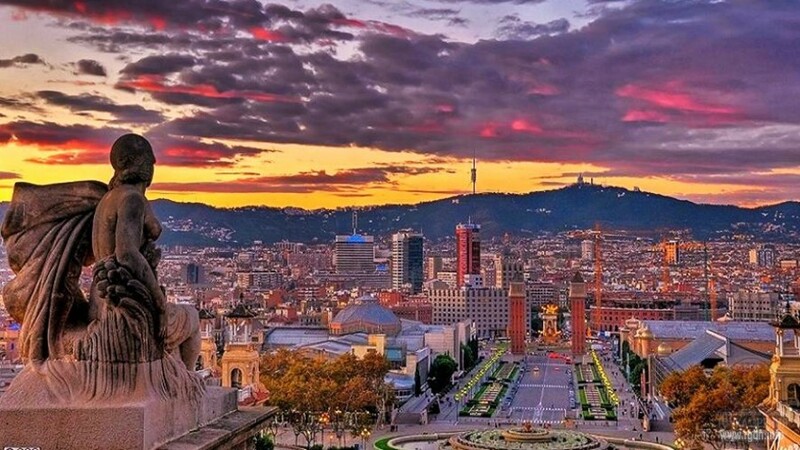 Recently I had a chance to visit the marvellous city of Barcelona which is rightfully called the Spanish jewel. 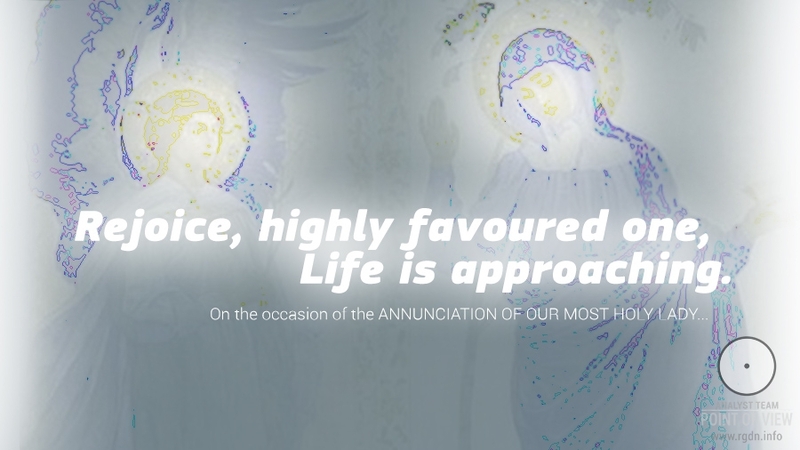 At that, this article is dedicated to the most important orientator for every human Soul, to the Force which represents both the Way and the Door – to Mary. Fortunately, lust like almost the entire planet, Barcelona is full of traces of the Great Virgin. 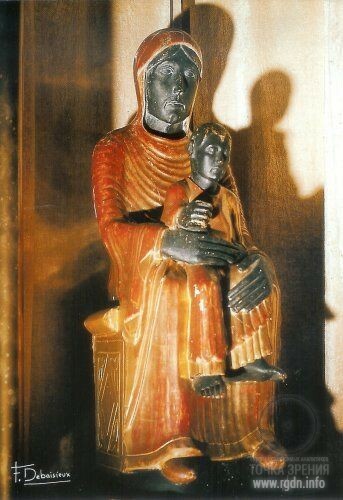 While visiting a number of churches and cathedrals we were surprised to see there were statues of the black-faced Virgin Mary in golden garments with a child in her arms. 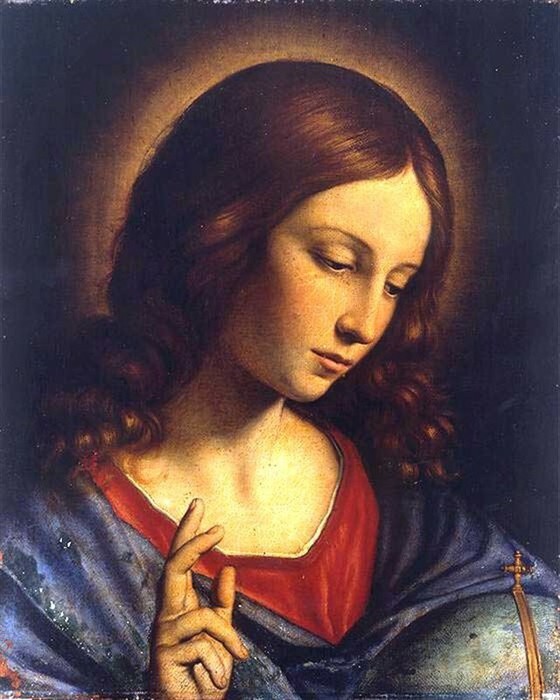 In her hand Mary holds a rounded item, whereas the child’s fingers are crossed in a blessing gesture. 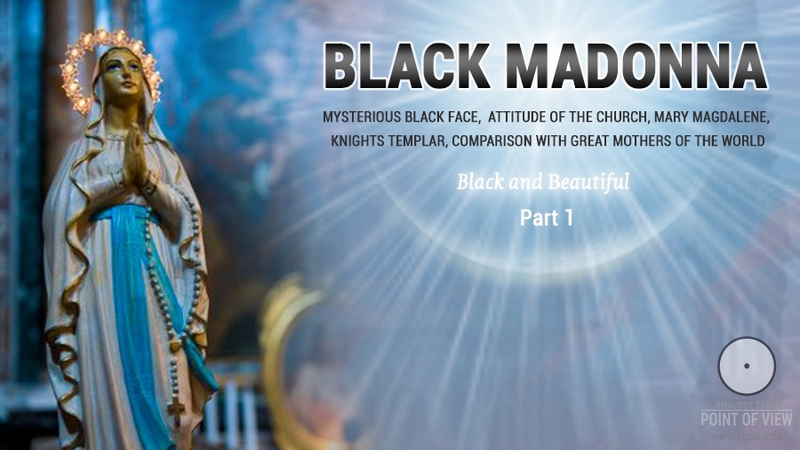 As a matter of fact, such black-faced image amazed us, for it is rather unusual for the Catholic tradition. 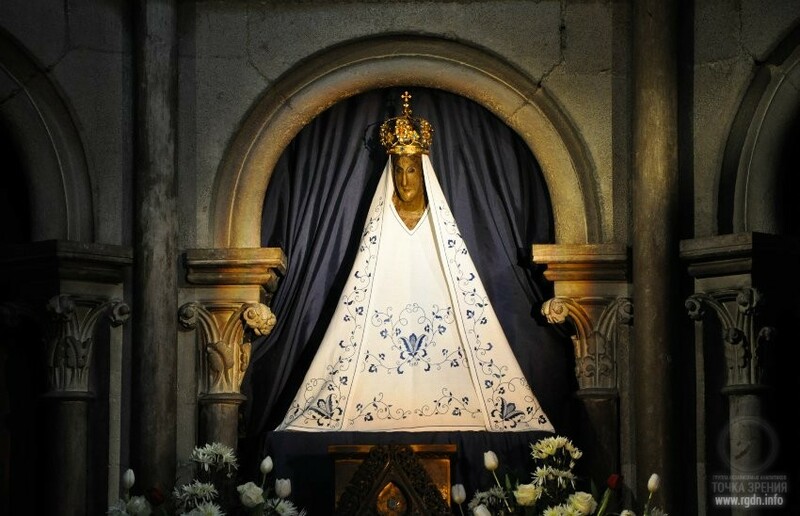 It’s an open secret that the worship of Our Lady in Catholic Europe has continued to this day. (More information on the subject is given in the article The Way of St. James. 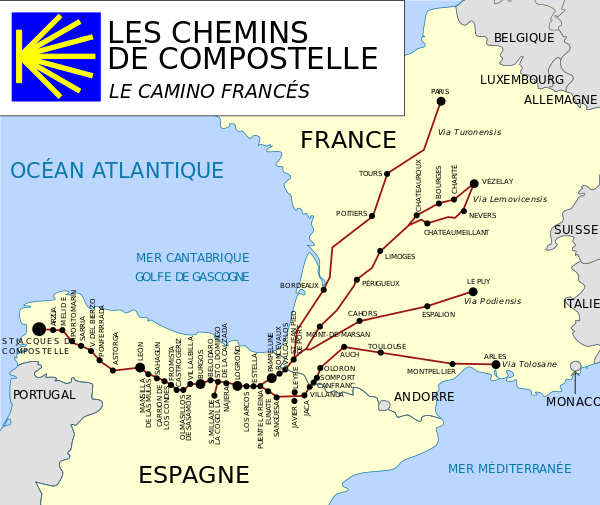 Santiago de Compostela – the Spanish Mecca of the Star. The Golden Ratio series.) 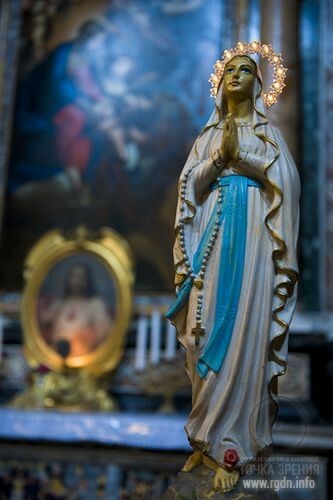 France, Spain, Germany, Italy… There are numerous churches and cathedrals, icons, statues and signs dedicated to Mary everywhere. 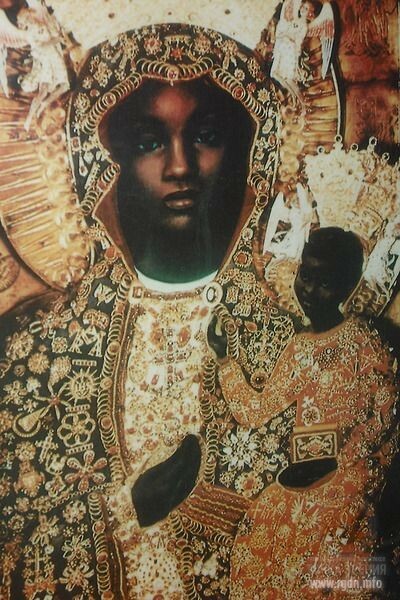 However, black-faced Madonna is still an unsolved riddle in the Catholic Church, because all initial sources indicate that Virgin Mary has nothing to do with the Negroid race. Nevertheless, the enormous number of black-faced statues that began to appear in the European countries approximately in the same years is an obvious fact. This is the number of statues as of today. 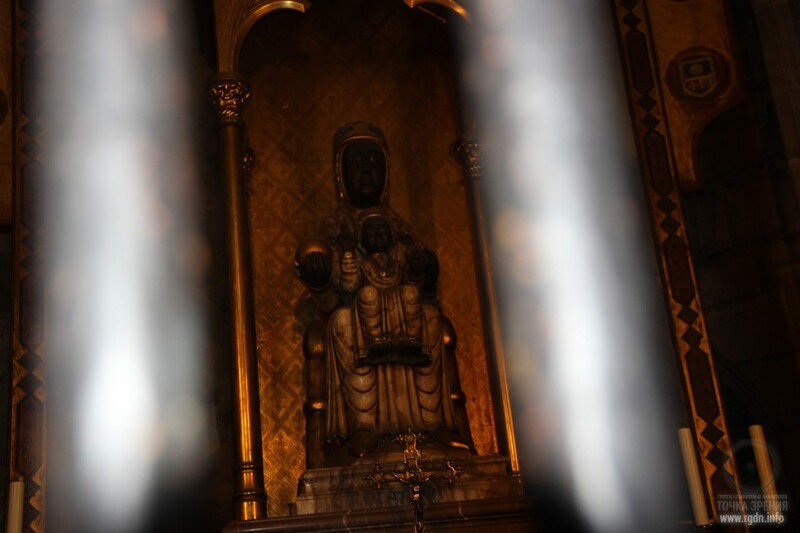 Among other versions there are those saying that faces of the statues blackened due to time and exposure to candle soot. There is also a quite curious version that the blackness is due to the carelessness of parishioners who touched the statues with their dirty hands. 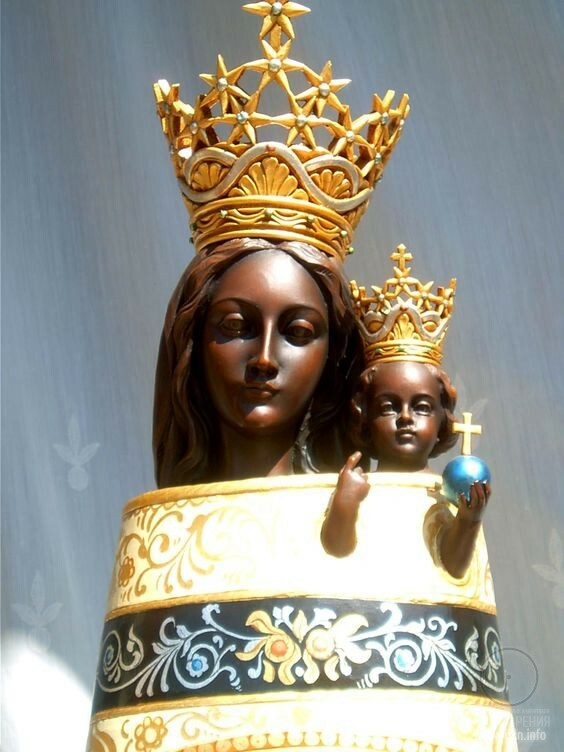 The persistent centuries-old unfriendliness of the official church to the Black Virgin phenomenon is quite amazing, too. Ean Begg repeatedly mentions that local priests whom he addressed with a request to tell about such phenomenon in their temples often either pretended they knew nothing, or avoided the conversation, or lied that the statues had disappeared right before his arrival. 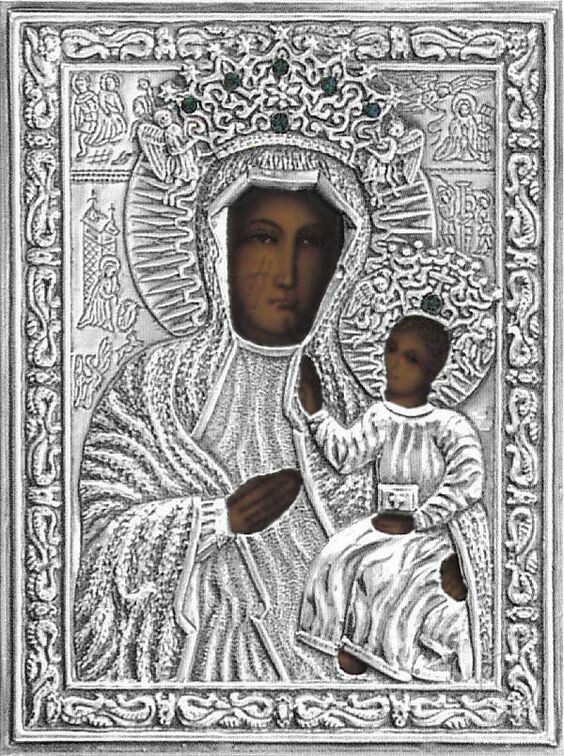 As for the report on Black Madonna presented in 1952 at the conference of the American Association for the Advancement of Science, it caused outright hostility of the church ministers. During the presentation all the priests left the hall in protest. 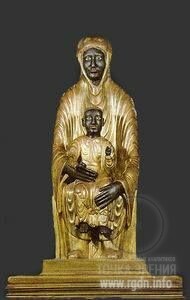 Perhaps, if we study the history of Black Madonna’s emergence we will discover the reason of such a contradictory attitude to her as well. 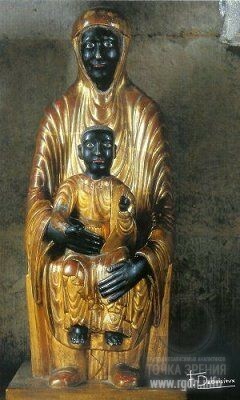 According to historical data, the cult of Black Madonna was brought to Europe by the Knights Templar. 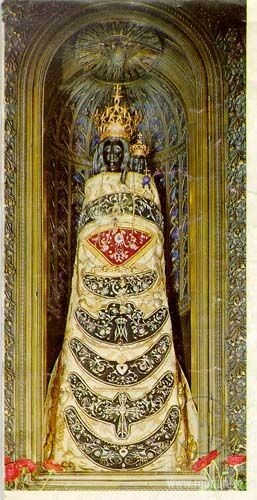 Over the century of their order flourishing (1170-1270) nearly 80 cathedrals dedicated to the Black Virgin appeared in Europe and about 500 churches were built in her honour. 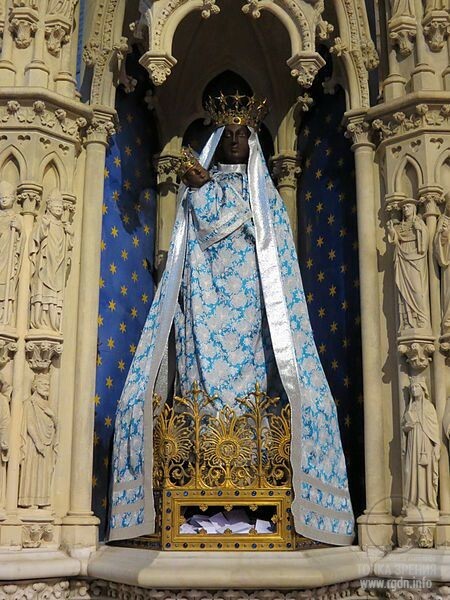 By the way, in Toulouse there is still a tradition of the red-and-white belt presentation to the Black Virgin (red and white are traditional colours of the Knights Templar). 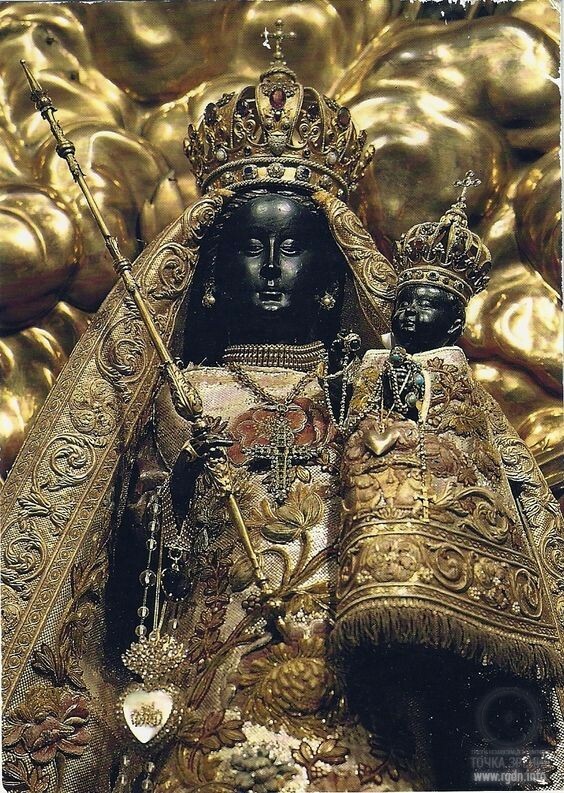 Many of the temples were built in places where Black Madonna was already worshipped. The trend of construction of cult buildings at the sites of more ancient shrines, e.g. heathen temples, may be observed in nearly all such buildings existing nowadays. As it is said, nature abhors a vacuum. 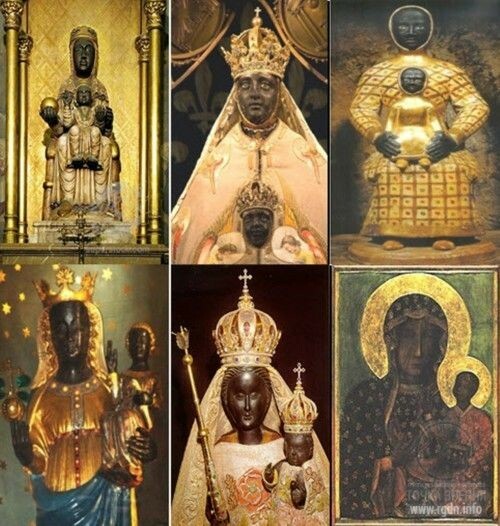 But in the case of sites associated with Black Madonna such trend has turned into a standard. Builders of temples dedicated to her thoroughly selected places for the temples and strictly adhered to certain geometric proportions in their designs, owing to which the Knights Templar became famous as true experts in sacred geometry. 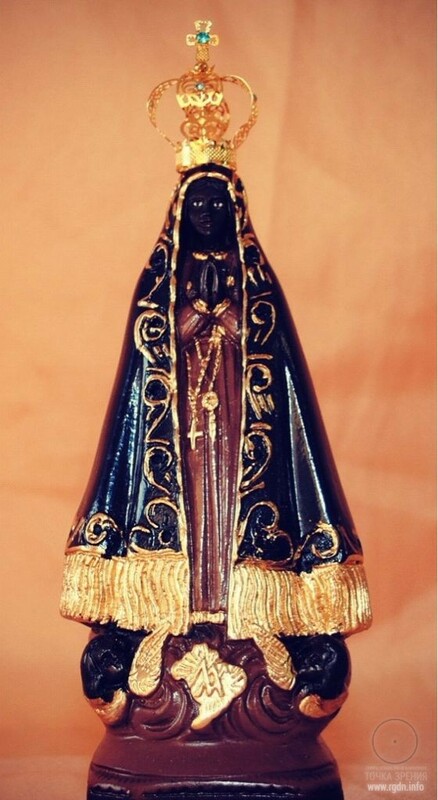 With a minimal error all Black Madonna statues have the same dimensions: the height of about 70 cm and the base of 30х30 cm. Here it would be appropriate to tell a little about the Knights Templar emergence and their ideology. 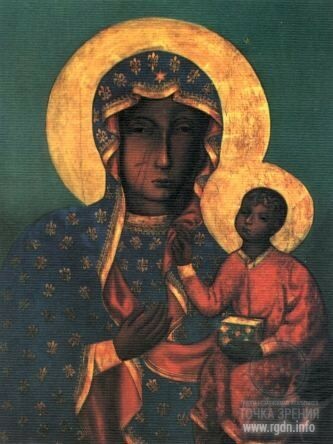 This will help us gain a deeper understanding of the Black Madonna phenomenon. It is interesting that the first reliable record of the Knights Templar was made only 70 years after the order became powerful and famous. As a matter of fact, before their much-talked-about settlement in the sacred Muslim place on Mount Moriah hardly many people knew of the poor knights patronized by Hugues de Champagne. The Dome of the Rock and Al-Aqsa Mosque, from where according to the Koran Prophet Muhammad went on his night journey with the help of Angel Jibrail (Archangel Gabriel), were given to the Templar order for free disposal. The then Jerusalem king Baldwin I contributed to that, having surprised everybody by his unexpected patronage over the unknown order. However, that was not the end of the story of “unexpected patronages”: after 9 years of the Knights Templar nearly permanent residence at Mount Moriah a halo of mysteriousness and even some mysticism grew around them, which was mostly due to rumours of the excavations they carried out under the mountain day and night. In Sensei of Shambala (Book IV) you can read about the further course of events and the discovery of the Holy Grail during the aforesaid excavations. Recurring to the main subject of this article, in 1126 (after the Grail was actuated) Hugues de Payens, the authorized representative of Hugues de Champagne, moved to Troyes in the north of France together with the core team of the Knights Templar. At that time Hugues de Champagne who had inherited the small town of Troyes was no longer an active leader of the order, though it was exactly he who in fact remained its active coordinator. In January 1128 the church council was arranged in Troyes, where the issue of legalization of the Knights Templar order was mainly discussed. 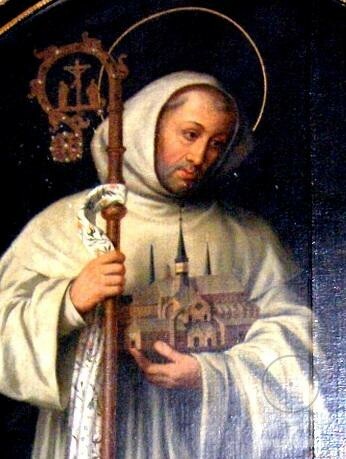 The initiator of the council arrangement as well as the promoter of the prompt official recognition of the order was a certain Bernard de Clairvaux. Bernard himself was a very interesting personality. He descended from an ancient Burgundy family that had a blood relationship with the famous family of Rex Deus. He was one of the most prominent personalities associated with the development of Christianity in Europe. Kings and Popes considered his opinion. Adamantly adhering to early Christian trends and beliefs, Bernard advocated “spiritualization” of church dogmata and regarded fusion with God as the principal meaning of every person’s life. 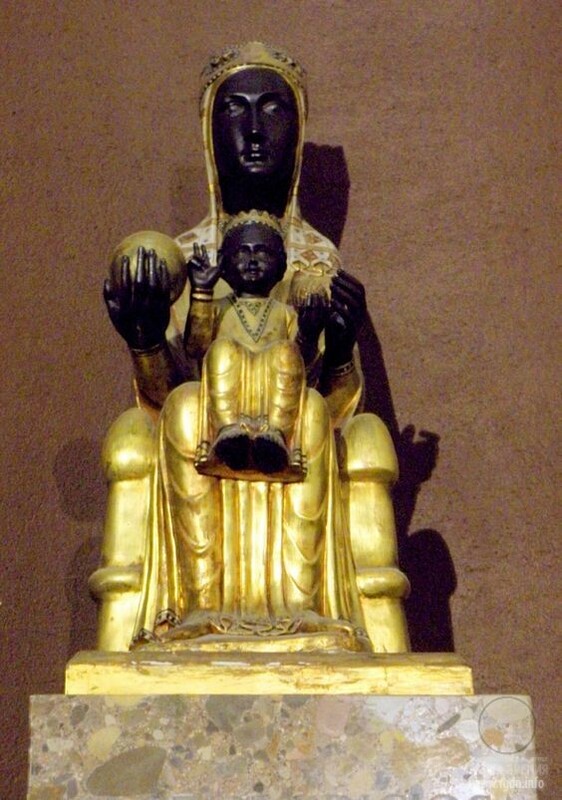 Bernard de Clairvaux was born in La Fontaine Castle near Dijon (where Black Madonna is worshipped up to the present time). 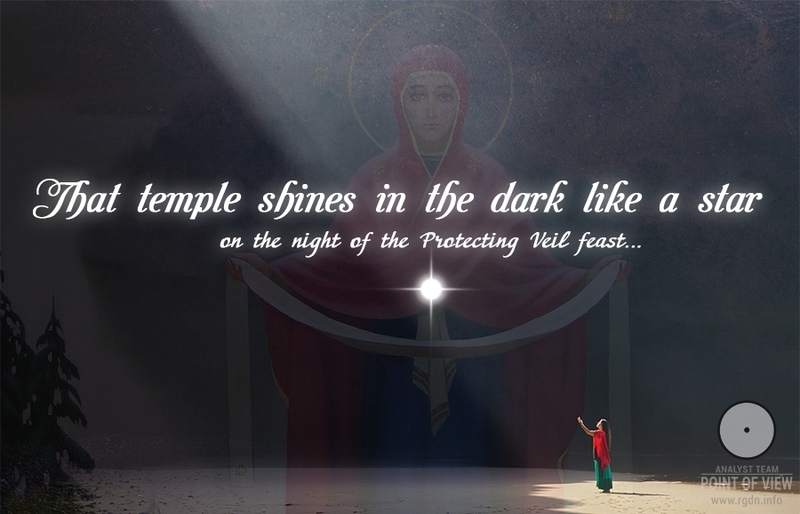 Thus, as history says, while little Bernard was deeply in prayer near the black-faced icon and uttered Ave Stella Maris 3 drops of milk came out of the Virgin’s breast, and the boy drank those, getting filled with Divine wisdom. Historians interpret this event in the biography of Bernard de Clairvaux in different ways. Some believe the story is a symbolic reverberation of initiation of Bernard into secrets of an occult order that worshipped Madonna. 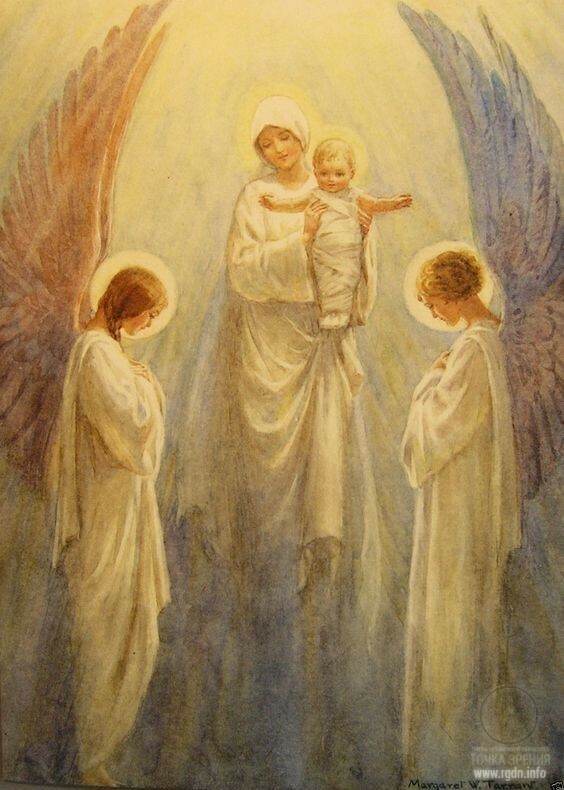 In any case since that moment Bernard decided to dedicate his entire life to God and to Mary as the bearer of His Wisdom. He wrote around two hundred unique homilies about Solomon’s Song of Songs – the poem revered by the Jews as one of the most important texts. 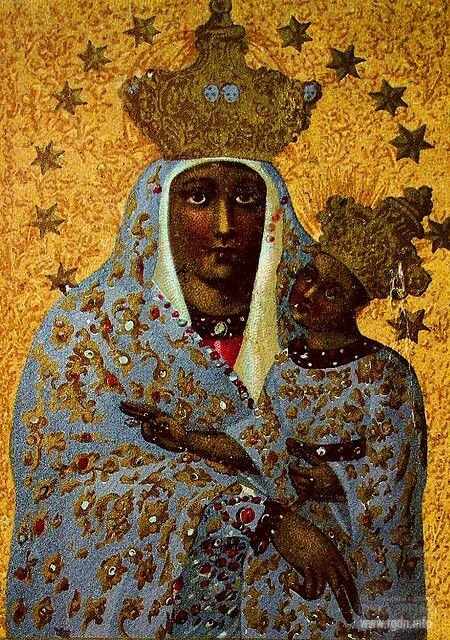 The Song of Songs begins with the following words: “Dark am I, yet lovely, daughters of Jerusalem.” Moreover, he actively encouraged pilgrimages to Santiago de Compostela and called it the Milky Way route (by the way, it connects sanctuaries of Black Madonna and is full of sites associated with Benedictine, Cistercian, and Templar orders). the obedience of Bethany, the castle of Mary and Martha. Yes, the castle of Mary Magdalene! A reasonable question may arise how could an organization that openly revered the feminine principle emerge and develop right before the Catholic Church’s nose when strict medieval restrictions were imposed everywhere, when Peter’s and Paul’s dogmata prevailed and maintained the indisputable priority of the masculine principle, and when Mary Magdalene herself was presented as a fallen sinner? 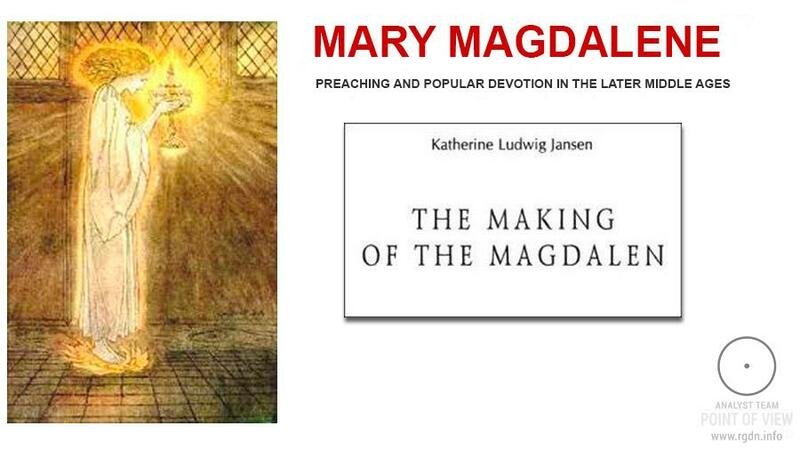 It is surely a correct question, and the answer to it will shed light on the essence of religious machinery and lift the veil from the centuries-old mystery that ministers of religion still endeavour to conceal in every possible way: who is Mary Magdalene in fact and which role does she play in the story of Jesus Christ and the history of the entire humanity? 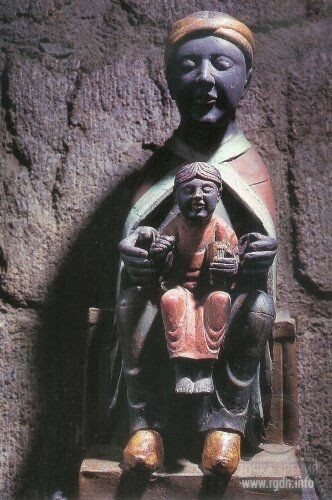 It’s not just Mary Magdalene whom priests have always had a dislike for. Should we trace the ideas which the church fights against we can see obvious recurrent motives that the powers that be do their best to suppress, disdaining no means. In this article we won’t describe all priestly “fears”, but touch only upon their panic denial of such phenomenon as the feminine principle. For centuries and even millennia since the initial emergence of political and religious machinery the Primordial Knowledge about the great generative Power which is the source and beginning of everything has been eradicated. Today the Knowledge is preserved only in myths and legends that are sometimes distorted to such an extent that it is very hard for people to find grains of the Truth there unless they are profoundly interested in symbolism. At that, pure Sources free of preconceived materialism such as the AllatRa book are valued as a gulp of fresh water in a desert for the one who’s dying of thirst. It’s a metaphor, isn’t it? Well, when I see with my own eyes how many human lives have changed owing to the Knowledge given in the said book, I understand sincere thanks are the least I can offer to express my all-embracing gratitude for this Knowledge of Life. 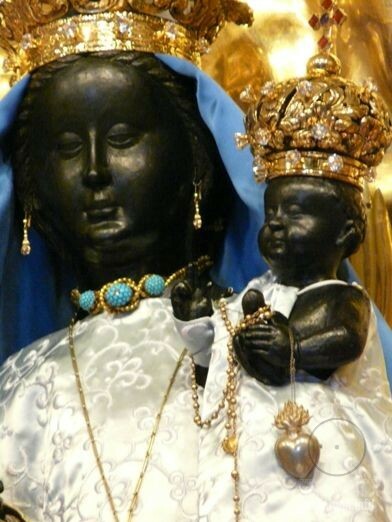 In The Cult of the Black Virgin Ean Begg unambiguously hints at the hostile attitude towards him only because of his intention to reveal some information about the worship of Virgin Mary, or more specifically of Black Madonna, and about her popularity among people which is so undesirable for the church. 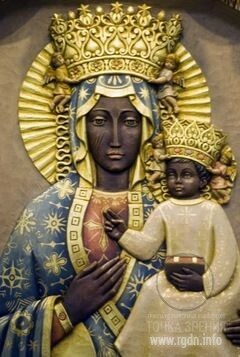 Maybe, the story of emergence of Black Madonna has played its role as well. As a matter of fact none of the statues was initially made, but certainly found somewhere nearby or straight at an ancient sacred site. 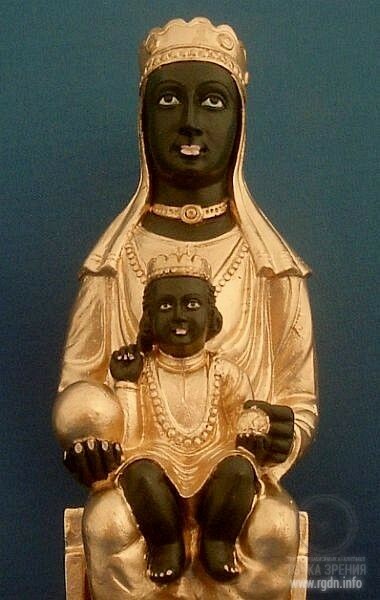 At that, it is ascertained that only about 2% of all black statues of Virgin Mary are originals, while the rest are reconstructed copies of the statues burnt, stolen or sunk earlier. 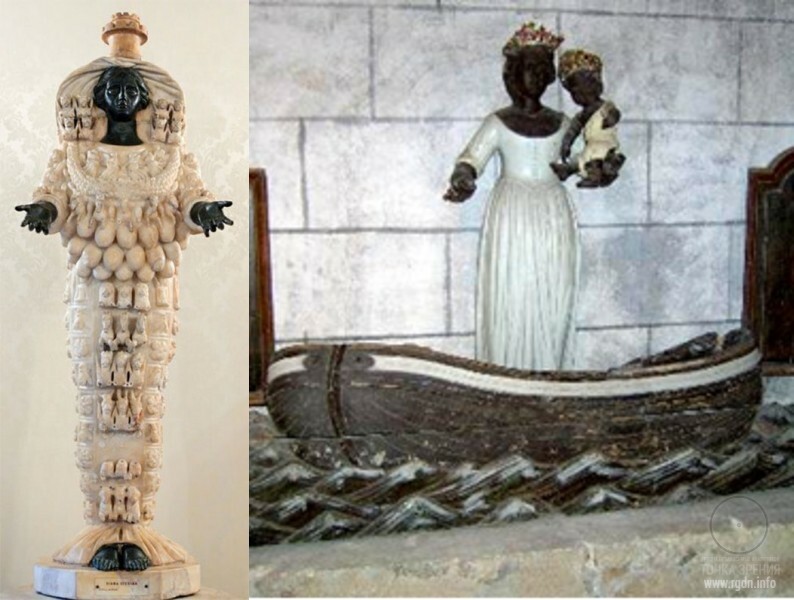 Repainting of black statues into the “traditional” white colour, which has been occurring everywhere, provokes questions, too. 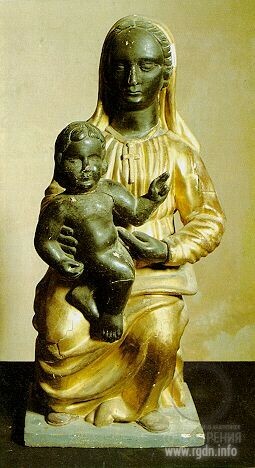 Paul Bonvin lists such direct cases of Madonna repainting as those in Allier, Limoux (Aude), Laurie (Cantal), Chaillou (Puy de Dôme), Tournus (Saône-et-Loire). 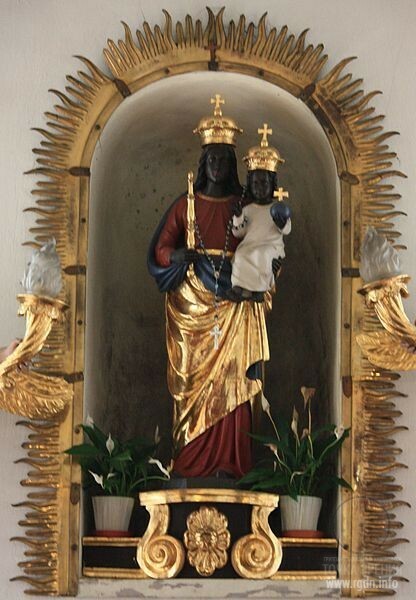 Furthermore, the German author Ursula Kröll describes the Black Madonna painting in Tongeren (Belgium). The statue was repainted in white only in 1990. When Ursula asked why they had changed the statue she got the answer that Madonna’s “simply more beautiful in such colour”. Now, the main question: whom do the statues depict in fact? A logical answer would be that it’s naturally Mary the mother of Jesus Christ, and this very answer is always prepared by the church for its parishioners. 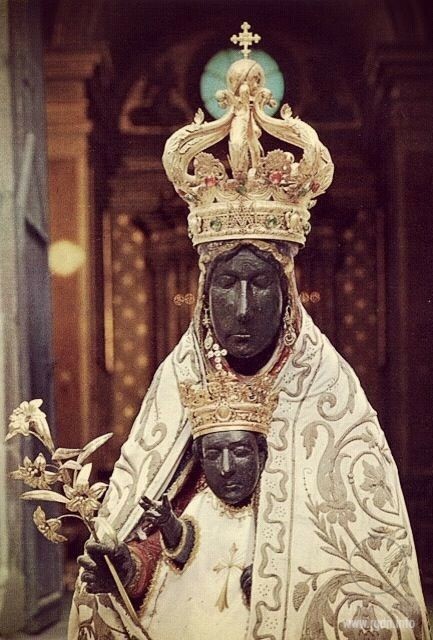 Despite the black face of the statues which has not been explained until today and despite the mysterious neglecting and thorough eradication of all relevant pre-Christian records, the church stubbornly keeps silent about the true origin of such phenomenon as Black Madonna. It is certainly because the phenomenon essence is the feminine principle. In order for us to strengthen such understanding, dear friends, we will have to study a number of sources and sincerely aspire to see grains of Truth there. Hopefully, this information will bring you to certain insights and further reveal itself deeper and from various sides. 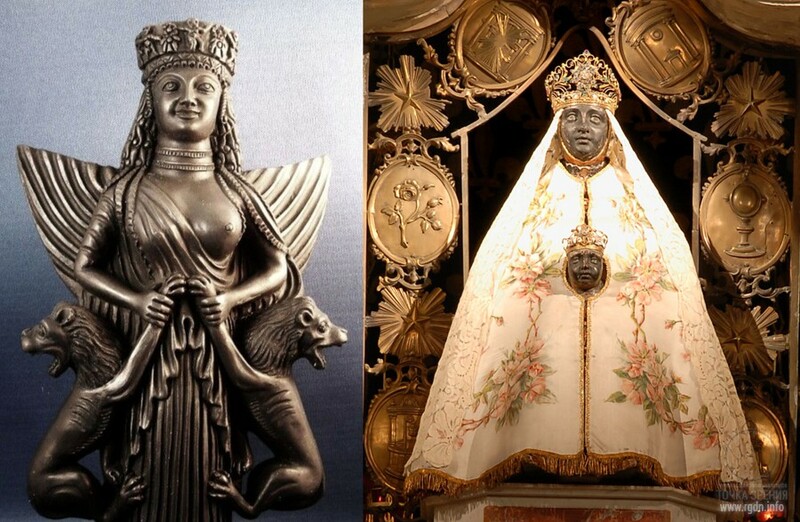 I will present two images for comparison: on the left there will be one of ancient female deities and on the right there will be one of numerous images of Black Madonna. 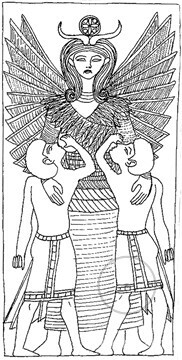 The Great Mother in ancient Egypt, the wife of Osiris who was also called “black” and considered an earthly incarnation of God (according to other sources, he was Bodhisattva who repeatedly visited the earth and is known by various names: Quetzalcoatl, Ahura Mazda, Archangel Gabriel, Rigden Djappo). 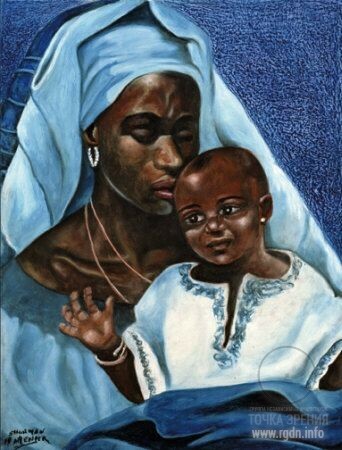 Isis was the goddess of femininity, water, fertility and healing, worshipped as the Virgin Mother. She was always depicted with a crescent-and-circle symbol known as the AllatRa sign. 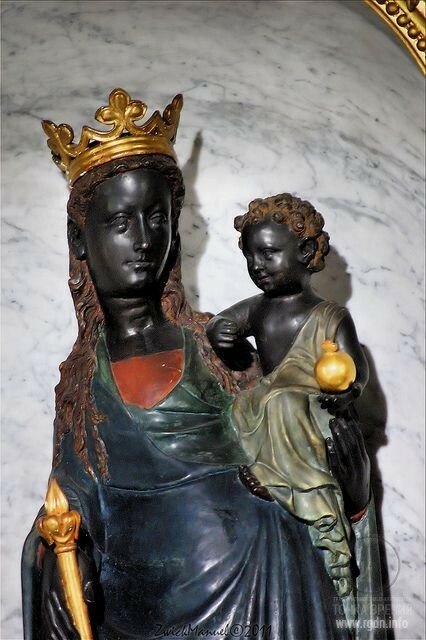 It is interesting that the height of Black Madonna’s “body” varies between 63 and 68 cm, which according to Bonvin represents an accurate proximity to the holy Egyptian Coudee (i.e. Isis) 63.5666 cm in height. With its three mouths and six eyes. There were however two cases when based on this secret knowledge the followers established mass cults. The impulse for that was given by the spiritual choice of two women who lived in different times, but both got the honour of possessing the Initial Sound formula. It happened so, for example, when the cult of Sumerian goddess Inanna (“the mistress of heaven”) arose from a secret society organized in the late 4th millennium BC by Vezha Inanna in the Sumerian city of Uruk. The symbol of the secret society was a polypetalous lotus, and their pictographic sign-ideogram was a ring with a hair braid which modern scientists, not being aware of its true meaning, attribute to the name of goddess Inanna. 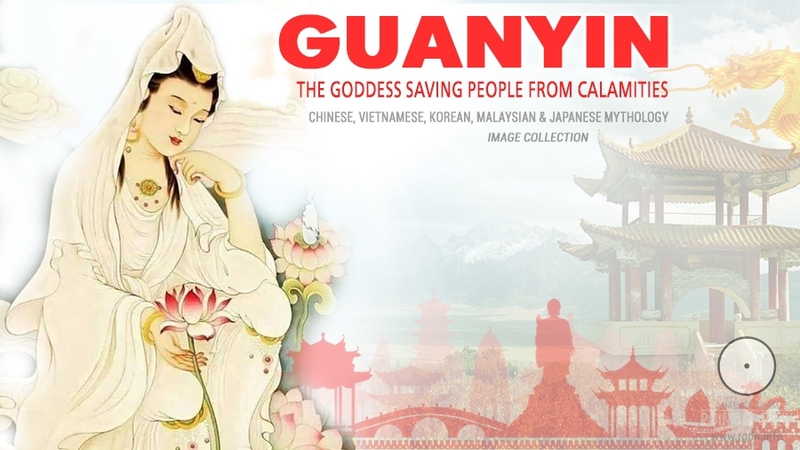 Besides personal spiritual self-development of its members, this organization managed to spread certain primordial knowledge among people, including the Lotus Flower spiritual practice, before they were detected by Ariman. Their spiritual work proved to be more than effective and provoked such a response in people’s souls and hearts that Ariman had to work hard to confuse and reorganize the ideology of this popular movement. Owing to his efforts Inanna herself became a mythological character and was presented as a Sumerian goddess of fertility, carnal love and discord. 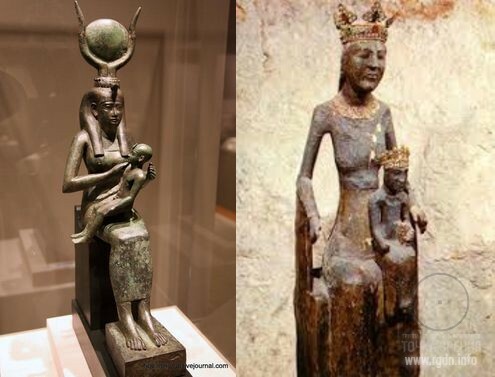 In western Semitic philosophy she’s the foremother and mistress of gods, the wife of the supreme Ugaritic god Ilu (Enlil in Sumerian). A very distinctive pattern was to depict Asherah with a “horned tiara” on her head, i.e. the crescent-and-circle symbol traditional for Virgin Mary, as well as with bare breasts feeding a child (let’s recall the story of Bernard de Clairvaux and the three drops of milk). In ancient Greek and ancient Roman traditions she was the goddess of fertility and female chastity, worshipped as the Virgin Mother. In the temple of Diana in Ephesus, which was one of the seven wonders of the ancient world, a totally black statue of this goddess was worshipped. 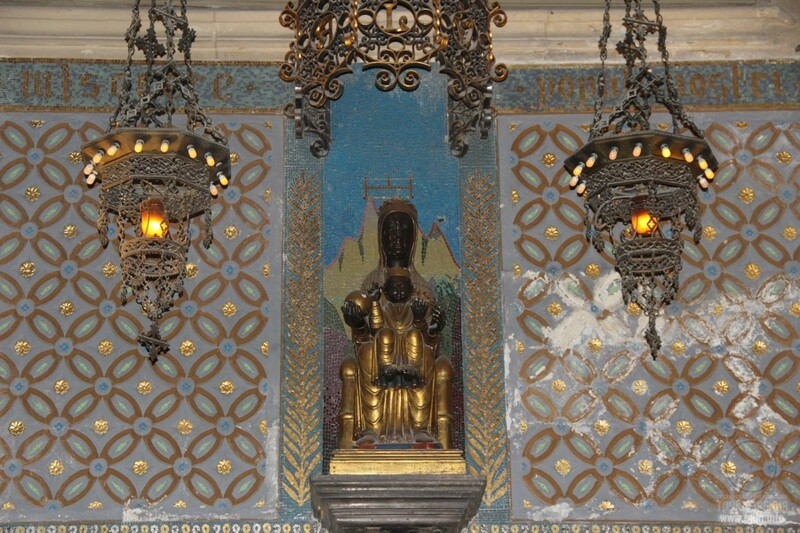 It is assumed that in the city of Ephesus Mary lived after Christ’s death, and her Ascension took place at a site called karatchalti (literally “the black stone”). In antique mythology she is the Great Mother of Gods, who regulates spontaneous elements of nature. 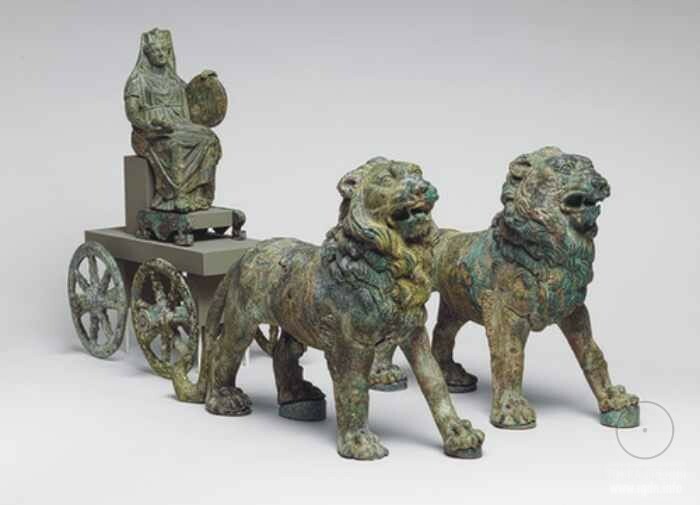 Cybele is usually depicted riding a golden chariot (the symbol of the earth). An ancient symbol of this goddess was a dark-coloured or totally black stone. 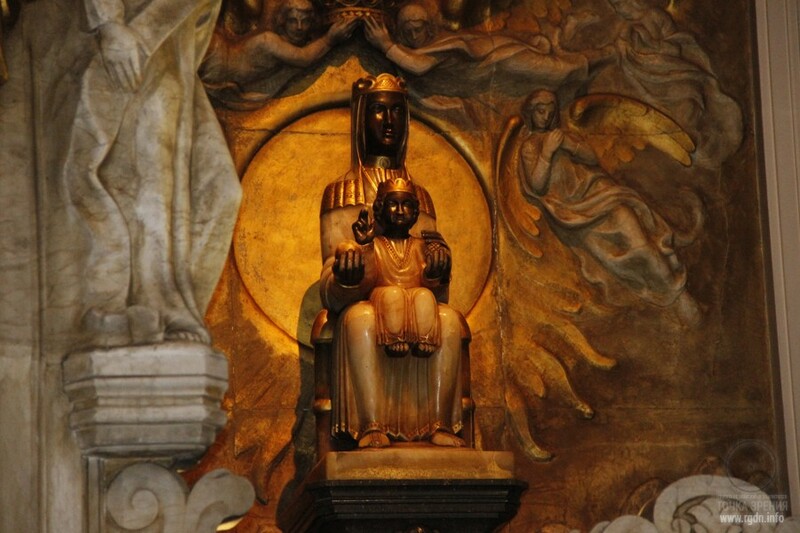 It is noteworthy that she was also depicted sitting on a “pulpit” with her feet resting on a cubic base, just like Isis and nearly all Black Madonnas depicted in a sitting position. 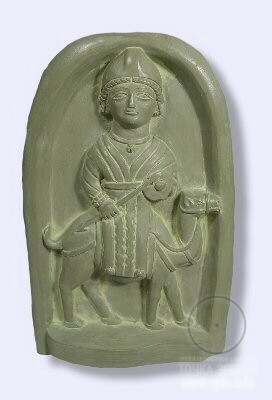 The ancient Arab and Sumerian goddess of heaven, moon, rain, and fertility. In pre-Islamic traditions she was revered among the Arabs as one of the three daughters of Allah (who was then considered to be the moon god), and her symbol was a crescent. According to Hisham ibn al-Kalbi, the idol of Al-Lat was a black stone placed in Kaaba. This goddess is identical to Sumerian Ereshkigal. Legends say Ereshkigal ruled over 7 judges of the underground world – the Anunnaki (at that, the word annunak originates from the root an meaning “heaven”, “deity”). 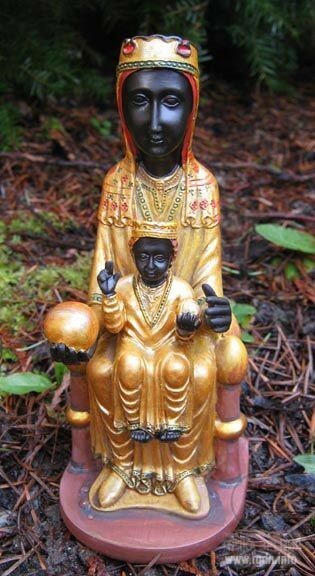 The phenomenon of Black Madonna is only a link on the way to perception of the great generative power of the feminine principle and its manifestation in the world. The knowledge of this power and its conductors is thoroughly concealed, eradicated and distorted by those for whom it is not advantageous to let people become aware that they reside in the illusion of material captivity. In every way possible the illusion is trying to make people retreat into limited material problems associated with the primitive fight for physical existence. Major lies are that there is anything more powerful than Love, the spiritual Love which like a gulp of the water of life vivifies those who have drunk it. In actual fact one who has managed to open up for this flow is no longer kept by bonds of the material world. The knowledge of genuine Freedom is carried through centuries and millennia. No matter how carefully distortions are made, they are only external weeds which can easily be rejected in favour of the true, sincere aspiration to experience Life. This article is only an introduction, a little initial step on the way of exploration of the great and marvellous gift preserved over centuries so that contemporary humanity could open the Gate to something totally different from the narrow material plane. I propose you, dear friends, to continue this research together and shall be grateful for any ideas, additions and links to new sources in the commentary section. As the ancients said, “True knowledge arises in the Soul, which is exactly Wisdom.” Therefore let’s not forget about learning, first and foremost learning of the most valuable Source – the Soul itself – through feelings. At that, the orientator on the way to the Soul, the eternal Wisdom, the Way and the Door is the generative power of the feminine principle. It has thousands of names and a single essence – Love.